Although Netflix has shifted its focus from DVD to online streaming, it's undeniable that there are still large number of folks subscribe for DVD via mail. Netflix's Q4 earnings results indicate that there are 4.1 million people paying for its DVD rental service. Accordingly, many users will encounter questions, e.g., is it possible to copy DVDs rented from Netflix? How about its DVD rental plans and prices? What are the top rentals on Netflix? This post has answers to all those questions. About 98% original quality will be reserved to ensure equally pleasant experience on any screens. 1. 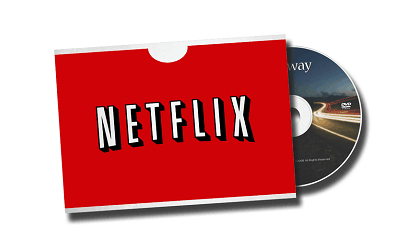 Once a DVD movie is sent to you from DVD-rental service Netflix, you can keep the disc indefinitely as long as you're paying the monthly free. However, if you don't return DVDs in three months, your account may be suspended or canceled. Sometimes you just don't have the time to watch the movie immediately and go beyond the time limits. Simply copy movies and tv shows on DVDs from Netflix to watch them later and send the discs back. 2. You may really like the Netflix movie rental and want to keep it. But as long as you don't return back, you won't receive new ones while still being charged. That price is enough to buy the movie. If you love the movie, you can always keep a copy. But you can copy for your personal use only. 3. There are many subscribers reporting damaged Netflix rental DVDs. Before you send the damaged disc back, you can try to copy the damaged DVD to save the waiting time. Besides, by converting DVD to digital formats, you can watch family favorites with kids repeatedly without damage the disc. 4. By converting the rented DVDs to digital formats, you can get rid of the incompatibility problems with discs for on-the-go convenience of watching Netflix DVD rentals on iPhone, iPad, Apple TV, Android phones & tablets anywhere freely. So now the question stands "how to convert and copy rented DVDs?" The answer is pretty simple: use the No.1 free DVD ripper - MacX DVD Ripper Mac Free Edition to convert DVD like never before. This 100% free ripper will easily make a copy of Netflix DVD rentals in MP4, MOV, M4V, H.264, MPEG etc, bypass the encryption limits imposed on those discs and make the DVDs playable on any mobiles or devices. Step 1: Insert the Netflix movie rental DVD into the drive and launch the ripper. Click the DVD button to load the disc. Step 2: Select an output file from the format list. You can also rip DVD to MP4, DVD to MOV, M4V, MPEG4, H.264 etc for iPhone, iPad, iTunes, Apple TV, iMovie, other mobiles and phones. Step 3: Click the browse to set an output folder. A range of editing options is offered. Click Edit button at the end of the DVD title, then you can trim the DVD length, add subtitles, capture your favorite part, crop and expand the video and etc. Step 4: To ensure the best results, check the boxes Safe Mode, High Quality and Deinterlacing. After all the settings, click Run and start to copy Netflix DVD rental movies. You can see 5x faster speed comparing with other copy freeware. A. Is it legal to copy Netflix's DVDs? "I wonder if it is okay to save DVDs rented from Netflix so that i can watch them on planes. If i carry the DVD with me, it may get damaged or lost and i will have to pay for it. So i simply copy it to my laptop and delete it after I finish. Is that legal?" You must know that in some countries such as US, you're not allowed to rip DVD movies rented from Netflix or other services, and you can't even do it with your legally bought ones. However, there are some grey areas. It is widely considered as reasonable to create a mobile copy of Netflix movie rental DVD for easier playback during the rental period. But you must delete the copy when you return the disc. Anyway, you'd better consult the DRM law in your area. B. Can Netflix find out if I copy the rented DVDs? "I recently want to rip a DVD I rented from Netflix, but I'm considering the legality. I want to buy the full DVD but it's a foreign movie and is distributed in other areas that I can't get to. Will Netflix tell if i have ripped its DVD?" The answer is no. There are users concerning that Netflix may include some special tech built in the disc, then if users copy Netflix rental DVDs and play them back, the tech will automatically report the IP address to the central server. Ripping is a process that only read the information stored on the disc, and copy the content out. The entire ripping and playback happens offline on your computer; there is no easy way that the rental company can tell if the disc is copied. C. Why the ripped DVD is in bad quality? "I tried to rip a Netflix rental DVD to stream to my iPhone, but it comes out all static and scrabbled. Does the problem something to do with some anti-rip scheme that Netflix imposed on their DVDs?" Some users who rip DVDs rented from Netflix for easier streaming only to find the output videos are scrambled, have no audio or no video but only audio, or out-sync picture and audio... Those are problems caused by DVD encryption measures, imposed not by Netflix, but the movie studios. For this purpose, MacX DVD Ripper Mac Free Version is a good program to rip protected DVDs from Netflix. 1. $4.99 a month for two discs per month, with DVD out at a time. 3. $11.99 a month for unlimited plan with 2 DVD out at a time. How it works: create your want-to-watch list - Netflix sends out the highest titles on the customer's list via mail - you mail back the disc and Netflix sends the next highest titles. 1. Bigger movie library - Netflix has started DVD-by-mail rental service since 1998. According to the New York Times, Netflix has Netflix about 93,000 available DVD titles to watch, which are about 10.5 times as large as its streaming library. 2. Better quality - Blu-ray discs is a part of Netflix DVD services, which offer you better quality than you can stream over the internet. This is because that even when you stream a movie at the same resolution, it needs more compression than Blu-ray disc to stream over the internet. 3. No internet buffering - Movies streaming, especially those in HD and 4K requires strong internet connection. If not, you will suffer a lot of buffering. Rental DVD is a good replacement when you go to somewhere with bad internet or no connection. By rip DVD to hard drive, you can watch Netflix rental movies anytime anywhere. There are sites like Netflix that offers you to rent DVD, for example Redbox. So what are the differences between Redbox and Netflix DVD rental business? * Redbox allows you to watch movies faster. With the instant service letting users rent a movie and return it two hours later, you have to wait for the mail with Netflix. However, Netflix has no due dates or late rental fees. Best free DVD ripper enables users to freely rip Netflix DVD movies to M4v, MOV, MP4 and more formats for on-the-go playback on iPhone, iPad, Android, Windows, Google phones & tablets. How to freely rip DVD to MP4 MOV AVI on Mac? Take a look at it. Complete List of Upcoming Movies on DVD.